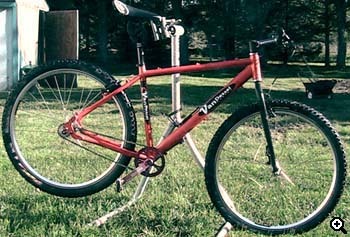 According to the Van Dessel Sports web page, the BuzzBomb frame is still available. That's one good thing. And it retails for only $299. That's another good thing. Then it says that the complete bike with Rohloff Speedhub costs $2299. What the #Q@$% is all that? The BuzzBomb frame is basically a cheap route into 29" for fixers and singlespeeders. Hold on to that, and don't get distracted by gearie goodies. We--that is, Oneota River Cycles, the shop we drink, I mean ride, out of--first saw the BuzzBomb at Interbike 2002. We were already curious about how 29" wheels might work on a mountainbike, having met 29ers at local MTB races, riding Fishers and Hunters mostly. The BuzzBomb clinched it. We decided we couldn't wait for the Surly Karate Monkey to come out, and picked up two BuzzBomb frames. I took a 19" while our local hardass wrestling coach took a 17". The frame comes in two versions: gearie with a derailleur hanger and singlespeed without. My S/S has disk brake mounts and an adjustable rear dropout, plus it shipped with some giveaway components courtesy of Sci-Con, the Van Dessel component brand. Since Van Dessel had been good enough to provide a sliding chain tensioner and a bottom bracket for free, I added one of their 135mm flip-flop hubs to my order. The buildup, which used a Surly rigid fork and some of the components off of my CUSS, went OK. Still, it was more work than I would have liked. The frame needed a little paint removed here, a little filing there... I think this was mostly down to the material. Like most low-end aluminum fabs, the BuzzBomb is a little bit flexible. Crank down on the bolts and the tensioners start to lock up. For the same reason, quick wheelflips, singlespeed to fixed, just aren't gonna happen. But those Sci-Con components were a problem, too. It took just a couple of months of hard riding for me to strip out the fixed-side threads on the hub. We built up three other Sci-Con flip-flop hubs on 26" wheels, with the same results. 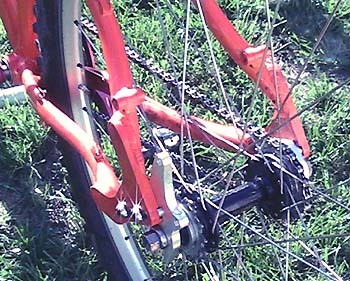 The problem was the design of the fixed gear side, which allowed the cog to crawl up the hub and strip out the threads. I switched mine out for a Surly, and haven't touched a Sci-Con since. Perhaps that little machining bug is fixed by now? Besides, we ride some decent climbs here in the upper midwest. Maybe this hub would work out better on flatter terrain. We went through a couple of the freebie BBs, too. Same story. Matters weren't helped by Van Dessel, who kept on messing up their deliveries. We usually ended up with more than we'd asked for, but it got pretty frustrating. In the end, I gave up and moved some more components over from the CUSS. For wheels we experimented with a Velocity road wheel and a 1.9" tire. Nice setup for commuting and light offroad, but when I dropped the air pressure to race, the tires tended to pop the bead. A quick change to a set of Velocity Dyads and WTB 2.1" MotoRaptor and the BuzzBomb flew through the trails. This brings me to 29" vs. 26". The first thing I noticed when I got aboard the BuzzBomb was squealing. Hard corners made the wheel flex enough that the rim rubbed on the brake. I thought this meant that maybe I was too large to be a 29er until the coach, who weighs about 75lbs less than me, reported the same problem. 29" wheels certainly take a bit of getting used to. You feel taller and maybe even a little awkward, like when you first leave the bar at closing time. But the ride is so much smoother, and rolling over small obstacles is such a breeze, that I soon got over it. Well worth a little brake noise. Jeez, I feel like all I've been doing is ripping this bike. The truth is, I really like the frame. The ride is everything you would want out of 7005 aluminum. Handles well, climbs great, light. It's even fairly agile once you've got used to the larger wheels. I'll ride mine until I break it. If you're looking for an inexpensive way to get into 29", this is the way to go. Not one to race, but certainly one to ride the hell out of. The frame itself is a great value, but the Sci-Con parts are maybe not such a good deal. Unless you like to tinker. Ron Moffit has been riding MTBs since '85. He's a S/Ser, just getting into fixed. Look out for him on a Black Cross Check with a BOB trailer and a cooler of beer at this years RAGBRAI. Visit the Van Dessel site to learn more about the company's products. Chris Accetta reviewed Van Dessel's Country Road Bob in 63xc.com #4.